After my surprising stellar experience at Mulberry Street in Bayswater, I had no desire to try any other London pizza. My travels through various parts of the city over the last two days revealed several pizza offerings, none of which were at all visually appetizing. However, the Snob’s cultural half, Music City Mike, arrived early for his evening’s concert only to have Pizza Express next door staring me in the face. The pizzas I spotted through their window looked appealing and tempted me. Hungry with a new found sense of adventure, I thought I would give this place a try. 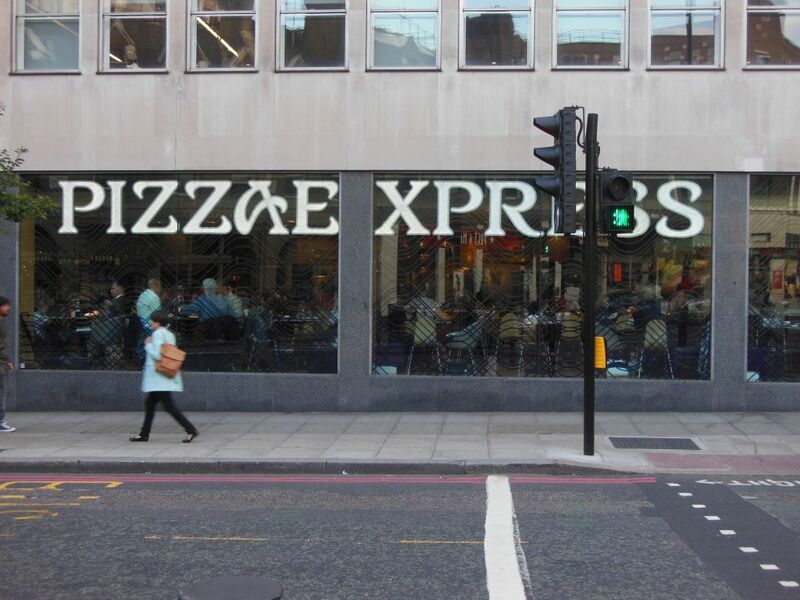 In business since 1965, Pizza Express is a poor name for this moderately upscale looking place. Their room stretches across most of a city block with a long window front looking out at the Great Portland Street tube station. 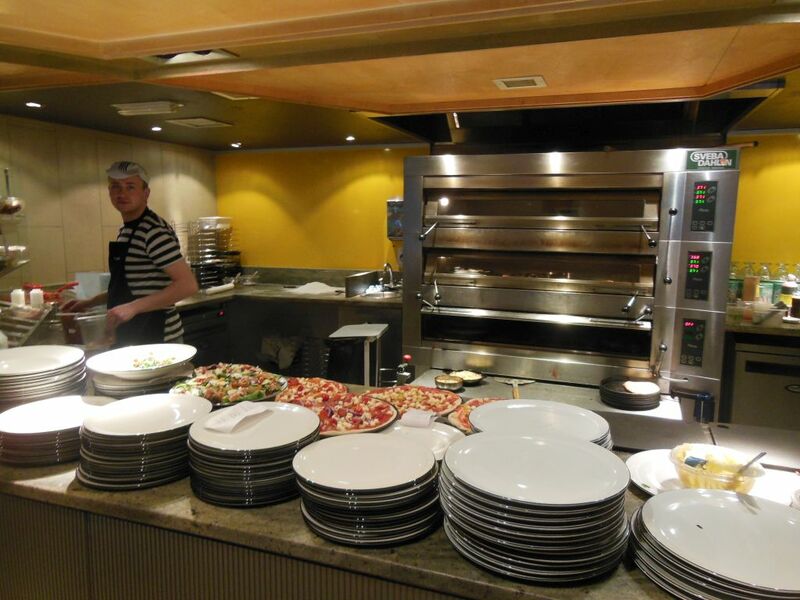 There is table seating in a long room with their somewhat normal-looking pizza ovens in full view. They offered three different styles of pie and seemed keen on having quite an unusual variety of pizza in addition to some other menu items. As far as pizza chains go, it is hard to believe that a place this respectable looking has over 400 locations in the country. 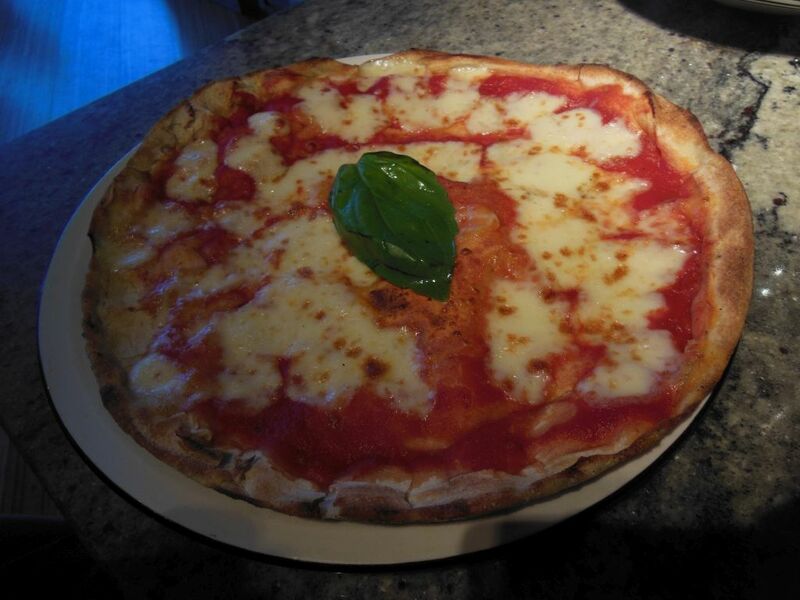 As always I stuck with the basic which in their case was labeled as a Margherita under the category of “Classic.” There was a footnote to this section that mentioned it could be made in their “Romana” style which would be thinner and crispier. They also offered a “Leggera” style which was lighter in calories. I passed on the Romana option, so I could judge them on their standard fare. When I asked about my order, my lovely waitress said that my pie would be “plain,” and that most people did not like the thinner and crispier version—they thought it was too un-pizza like. Getting used to London-speak, I ordered a bottle of “still”water and a “starter” Caesar salad to go along with my £7.80, 10-inch pizza. The salad was fine, but I chose to pass on the two full anchovies sitting atop the lettuce. The pie arrived shortly thereafter, and although it looked somewhat normal, it was not sliced. This made me glance around the room where I saw that everyone was “knife and forking” it. There was also a large basil leaf in the center which looked to be more for show rather than flavor. Alternating between ripping and slicing with my knife, I did my best to pull off small triangles that I could fold and eat without the cheese falling off. The pie was noticeably quite tepid bordering on cold. The first taste to grab me was a slight tartness to the tomato sauce. The cheese and oil, however, tasted quite good, but the thin crust was soft and doughy with no crunch to it whatsoever. There were not any detectable spices. To be frank, by folding the pizza, it was akin to eating a tomato sauce and mozzarella cheese sandwich. The pie reminded me somewhat of the flatbread pizzas you see at a lot of American restaurants these days. All this made me wonder if I should have gone with the thinner and crisper version. What I ate was by no means awful: It was just far from Snob-worthy pizza. 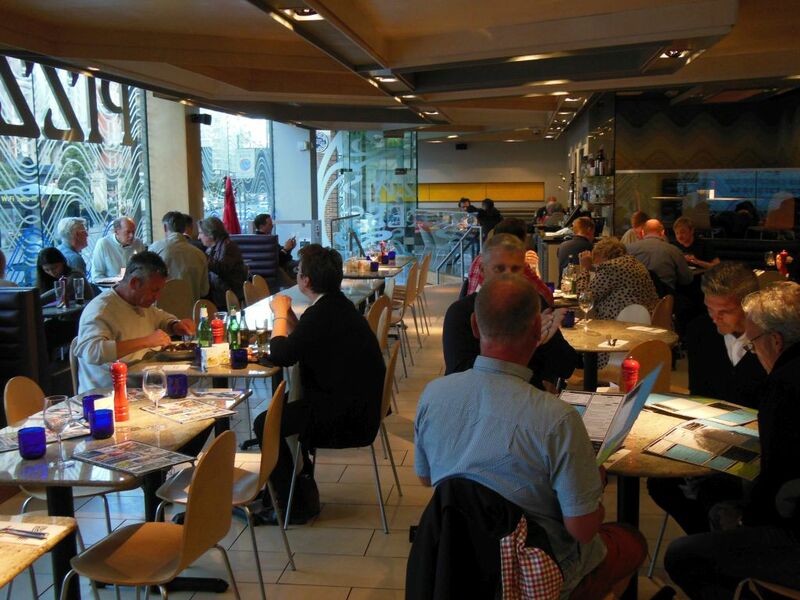 Pizza Express is a quality place using fine ingredients and presenting a high standard of service. It is certainly a place where a “toppings lover” could really enjoy some of their gourmet offerings. I was glad that I gave Pizza Express a try, but their diversion from classic pizza just didn’t do it for me.